Let’s start with this: I’m not at all above feeding my kids a box of mac and cheese, or declaring that it’s leftover night and wishing everyone good luck, or piling us all into the car to go out for ramen. But I do try to make dinner for my family with some frequency. Do you know this nice blog called “Dinner: A Love Story“? I was just introduced to it recently. It’s all about feeding your family dinner every night and of course they have a new cookbook (who doesn’t these days? ), apparently full of recipes and strategies for feeding a family of picky eaters without going crazy. I should probably get that cookbook. But in the meantime I thought I’d share a tip of my own. One of the ways in which I manage to get dinner on the table on a regular basis is by using the term “dinner” fairly loosely. Some examples: breakfast for dinner? Sure. Sandwiches? If necessary. Tonight’s dinner? These pretzels. The girls gleefully chose their own dips (peanut butter, rhubarb jam, and applesauce), and the grown-ups had theirs with a sweet grainy mustard. I made a pot of that great turnip soup soup as well, but it was certainly the accompaniment to the pretzels and not the other way around. It’s a little time-consuming to make pretzels (you boil these in a baking-soda bath in addition to letting them rise twice), but it was a fun project to do with the girls and the resulting pretzels were very good. They have just the right combination of crispy bottom and chewy center, with a little tang that I assumed was from the rye flour, but Kim Boyce tells me is from the baking soda instead. This recipe is adapted from Boyce’s Good to the Grain cookbook, which I want to cook from front to back after having started with those Rhubarb-Strawberry Cornmeal Tarts recently. There’s a great-looking recipe for graham crackers, do you think I’ll be able to get away with calling those dinner? 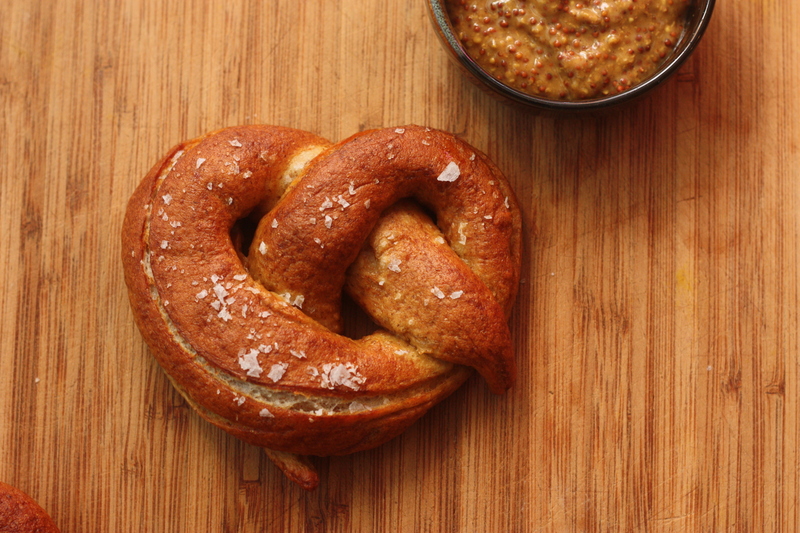 Soft Rye Pretzels: Whisk 2 1/4 tsp. yeast with 1 1/2 c. warm water and 1 Tb. honey in the bowl of a stand mixer. (Of course you can also mix the ingredients in a large bowl and knead by hand.) Add 1 c. dark whole-grain rye flour, 2 1/2 c. all-purpose flour, and 1 Tb. kosher salt and mix again. Knead with dough hook on low speed for 8-10 minutes, adding up to 1/2 c. additional flour as needed to form a cohesive, workable dough. (Boyce says it should be “tacky” but not “sticky.”) Lightly brush a large bowl with melted butter and scrape the dough into the bowl. Cover with a towel and let rise for about 1 1/2 hours, until it has doubled in size, then turn dough out onto your work surface and cut into 12 pieces. Roll each piece of dough into a 17″ length with tapered ends and form into pretzels. Transfer to two baking sheets brushed with more melted butter and allow to rise for 15-20 more minutes. Meanwhile, bring 10 c. water to a boil in a wide pot. 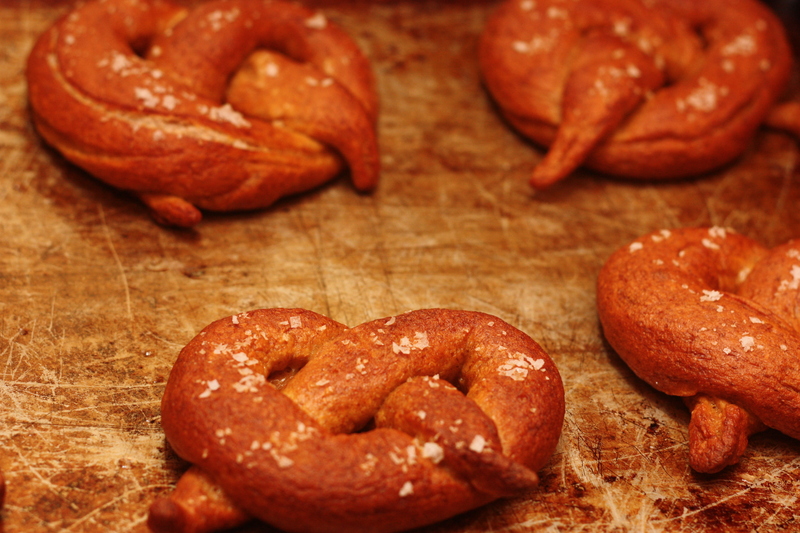 Add 1/2 c. baking soda when it boils, then poach the pretzels in batches for 30 seconds on each side. Transfer to a clean towel, pat dry, and return pretzels to the baking sheet. Sprinkle liberally with flaky salt. Bake 15-18 minutes (until the pretzels are a dark mahogany color) at 450, with your baking sheets in the top and lower thirds of the oven (switch them halfway through baking). Transfer pretzels to a rack to cool. This entry was posted in Baking, Breads, DIY, Feeding Kids, Food, Recipes, Snacks and Apps and tagged baking, bread, cooking, DIY, family, homemade, kids, lifestyle, recipes, whole grain on June 5, 2012 by emmycooks. This is just the kind of ambitious cooking project I like for a quiet day. I’ve never had pretzels like this – they sound good! I bet the girls had fun shaping theirs! Yay for clean out the fridge night! We do it at least once a week! Oh wow – yeah – it is like spelunking sometimes! Hehe! I haven’t made other boiled homemade pretzels, but these were so good that I think I’m going to! Do you have recipes you’ve liked? I will definitely be taking a stab at these. Anything with rye flour is a winner in my book. I like it too. I am pretty excited to bake my way through this cookbook! And I also mean to make Heidi Swanson’s rye pie crust sometime soon, have you tried that? Oh, not yet! But her rye crust really does look beautiful, doesn’t it? Oh my! I adore rye in bready things. These look really very, very nice. Much more appealing to me than the average pretzel. They were pretty outstanding! I will be experimenting more with rye flour (and bready things) as I work through this cookbook, I think! These look yummy. I love pretzels, especially soft ones but have never had rye pretzels. Homemade soft pretzels remind me of my childhood, we always made them on New Years, and my mother would let us make our own shapes like our initials, etc. Fun! Despite the fact that I write a blog about family dinner, I think my kids’ favorite dinner is “crazy dinner”, which is a little bit of whatever is leftover in the fridge, plus Cheerios. Though sometimes we switch the name up to “wacky dinner” if we’re feeling extra punchy. Dinner is family sitting at a table, together. Beyond that, everything else is gravy. I love this re-definition of dinner. Very cool. And these pretzels look amazing. I can’t wait to try them!